We had a rainy and cooler summer this year and as a result, all the local gardens thrived. This vibrant showy Hibisicus bloomed in a large pot all summer in my neighbour’s garden. Most of the time, there was a stunning display of multiple large vibrant red blooms. 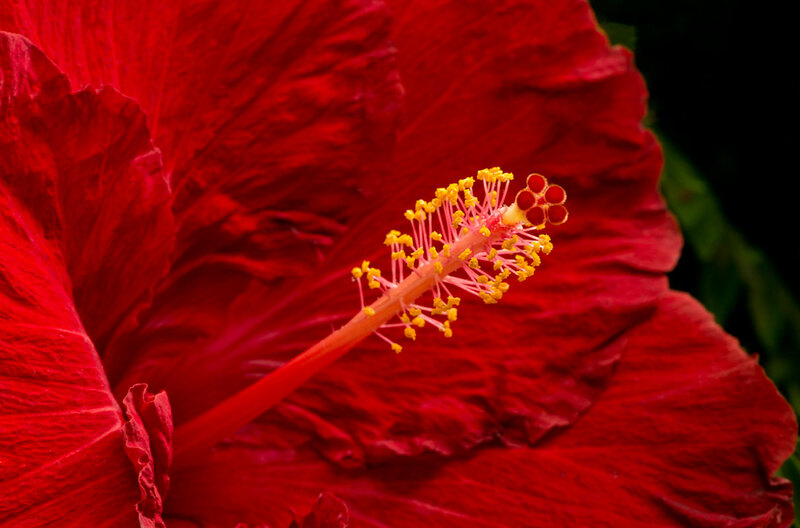 Hibiscus are native to warm-temperate, subtropical and tropical regions throughout the world. 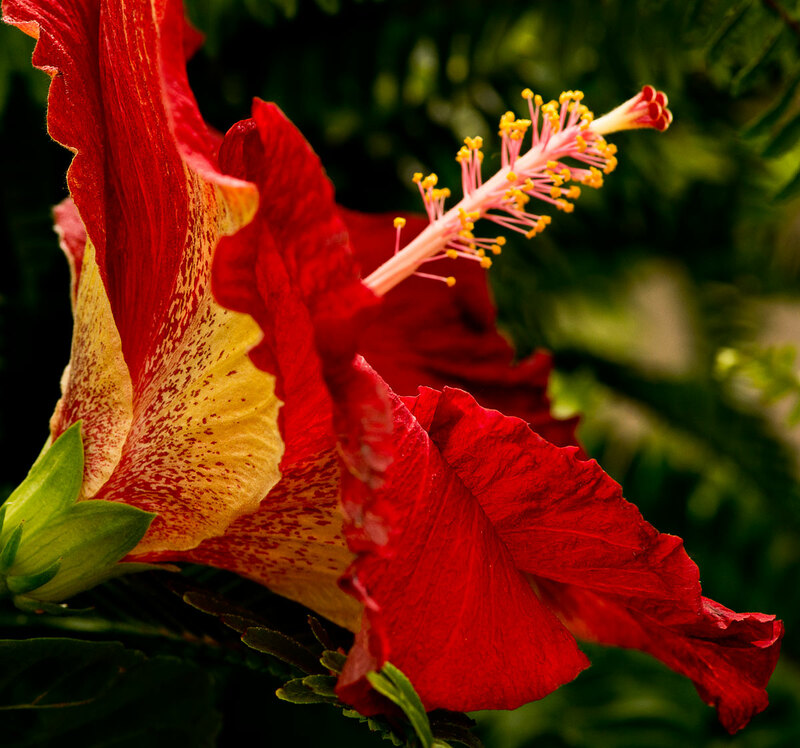 Often hibiscus are grown to attract butterflies, bees, and hummingbirds. 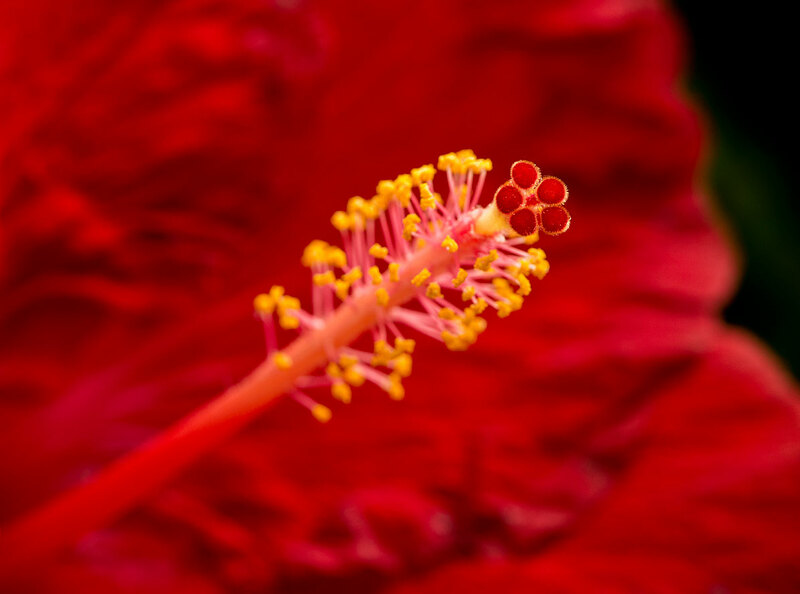 I photographed this Hibiscus twice. I was unhappy with my first attempt, which was done handheld in poor lighting. 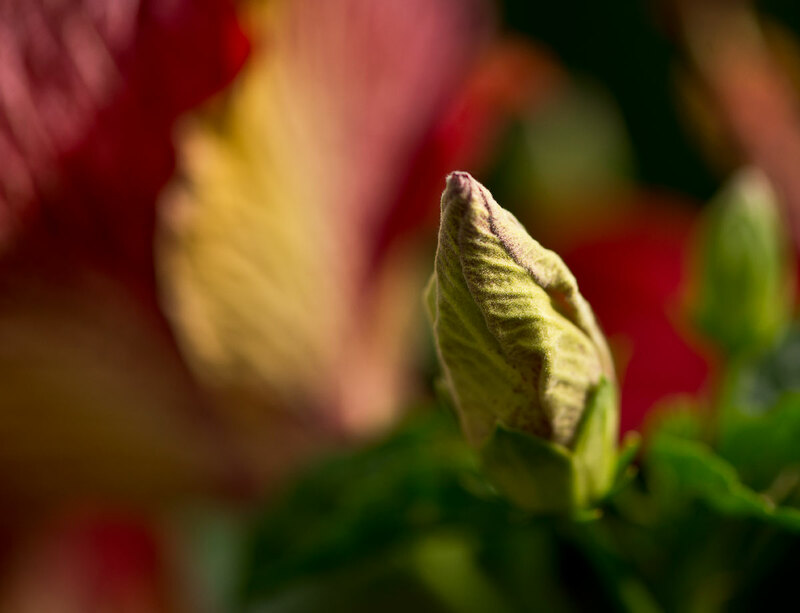 So I returned early that evening with my tripod and warm sunlight lit this Hibiscus just long enough for me to capture these images. Usually I lead with the best image but I wanted to start this series with the whole flower and follow with what I think are better macro perspectives. My favourites are the last three images. If you have a favourite, let me know. Click on the images to enlarge for better viewing. < Wishing You a Very Scary Halloween! The last two for me! All good photos. I have one of those small round foldable 5-in-i reflectors which I find immensely useful in adding light to a scene, such as flower photography. The only drawback is to find someone to hold it, unless you’re using a tripod and remote. All so good Beth, adore the rich swirl of #4! I do love using my macro lens. I almost always get good results. Thanks for the visit and comments. WOW!! Those are some red flowers! I hope you mean that in a good way! Thanks Sue. It’s good to have neighbours that plant beautiful flowers. Thanks Tom. How beautiful. I like the last one, but I also like the first because it shows the whole flower. I enjoyed the rich colors of this flower. Thanks, the blooms were very large and it was hard to move around the pot to get the whole flower in the frame. Appreciate the visit and comment. Love the last on Beth in particular Beth – looks like a microscopic photo – almost “other-worldly”. “Other- worldly”…I like that. Thanks Phil. 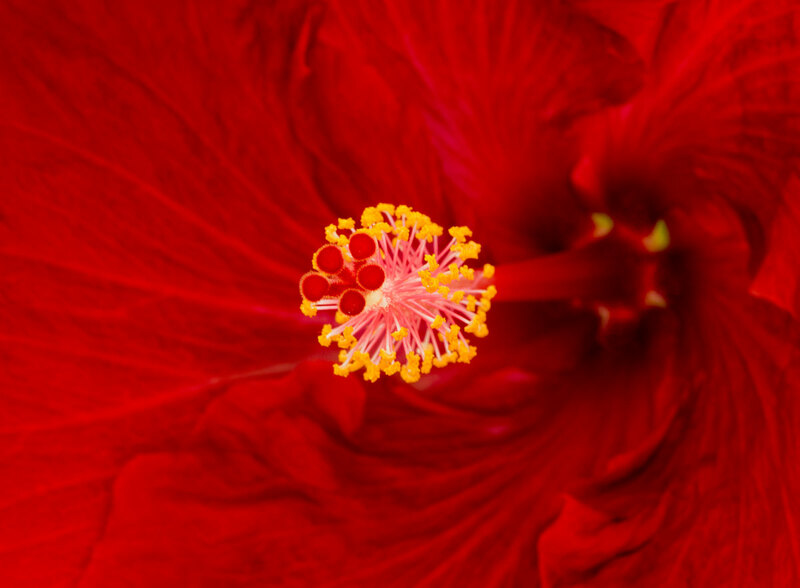 These are the most beautiful hibiscus photos I have ever seen. Thanks for sharing. Best comment yet! Thank-you very much, wonderful to hear. Thanks for sharing the buns on your Facebook page. 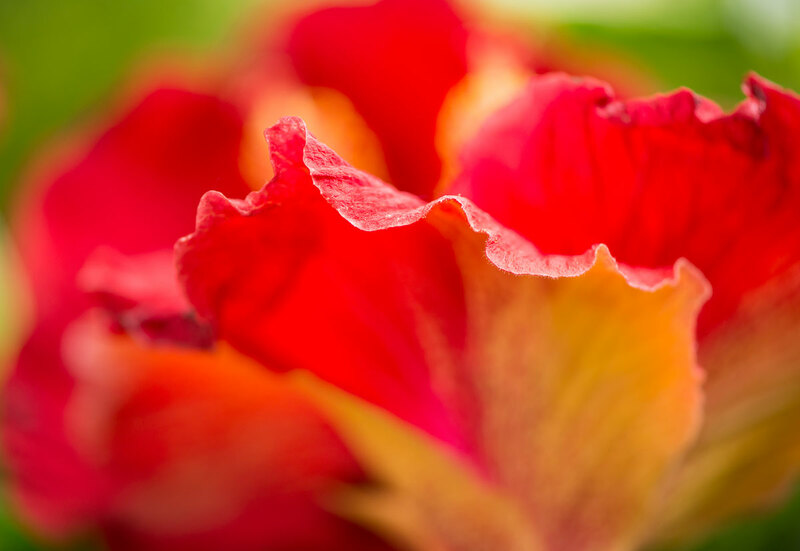 The Hibiscus photos look wonderful. I love the way you captured the fusion of the stamens into a tube around the stigmas. It looks beautiful. Have a lovely fall! Thanks Liz, glad you like them. We are having a beautiful fall will post some fall colour photos soon. Gorgeous flower study Beth … what a lovely way to spend an evening ! One of my favourite ways to spend a summer evening. Love your descriptions of my images. Thanks Poppy! Thank you very much. Glad you like them.